In the days following a disaster, people who are unable to meet their immediate essential needs for temporary accommodation, food, essential clothing and medication may be eligible for financial assistance. Emergency hardship assistance is available as a contribution to support people directly impacted by a disaster to meet their immediate essential needs for food, clothing, medical supplies or temporary accommodation. are unable to meet your immediate essential needs for food, clothing, medical supplies or temporary accommodation. Emergency hardship assistance is not asset tested. If deemed eligible, applicants may receive $180 per person up to $900 for a family of 5 or more. The loss of power to your home is not an eligibility criterion for access to emergency hardship assistance. However, if we are able to verify you have had no access to power for more than 5 days, you may be eligible for an Essential Services Hardship Assistance grant. When completing an online application form by yourself or with the assistance of a Community Recovery Hotline customer service officer you will have the opportunity to choose either to have the funds electronically transferred (EFT) to a nominated bank account (preferred method), processed in timelines established by your nominated banking facility, or to visit a Community Recovery Hub and collect a prepaid Recovery Debit Card which can be used at all retailers with EFTPOS facilities and all ATMs. If you wish to check your balance of a Recovery Debit Card, you can login to check the balance of your card. Activation of the Australian Government Disaster Recovery Payment is the decision of the Australian Government. Under this payment, people who have been affected by flood and storm-damage may also be eligible for financial assistance of $1000 per adult and $400 per child. a recent rates notice, electricity or other account showing your current address. If you don't have identification documents, help is available to replace lost or destroyed documents. 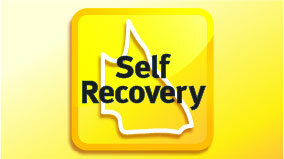 Access to vital information about Queensland disasters and emergencies is now available through the Self Recovery App.